Jute Twine is a strong thread or light string manufactured form two or more smaller strands or yarns that are twisted together. Jute Twine is highly useful for executing various tasks that may include lashing branches during building shelter, or stringing up a poncho due to its less stretching ability under load than other materials like para-cord. In addition to this, it is light in weight than para-cord making it more efficient. One can find varieties of jute twin spools in the markets in different colors. It is used in versatile applications due to its property of excellent fire making. It can be easily shredded using a sharp knife or rock. It can be folded into a bundle that can easily catch fire and spark. Adding twigs, small wood chips, pine resin, fat wood, shredded bark, or any other tinder to the twine of jute, a user can make a tinder bundle with ease. In addition to this, jute twine with a ferro rod is considered as the quality fire starting combination. This cording material is widely used in craft stores for varied applications. Durability and strength of jute twine make it more perfect for wrapping up the mailing packages so that they can be transit safe as well as secure to the destination. In addition to this, it is also used to craft amazing gifts for family members and friends. 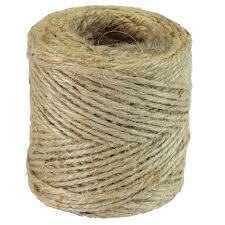 Jute twine is also high in demand for making whipped rope, string figure and games. Above all, it is extensively employed in tying up a plant in gardening and tethering a kite, boat, etc. Jute twine is considered as the perfect substitute of Jute yarn for needle crafting works. Jute twines are used with crochet to produce highly innovative baskets; vase covers and enticing decorative glassware. Coasters, garlands, table runners, ornaments, place mats and the list goes on made from twine of Jute are perfect masterpieces of quality and utility.